Coach John Wooden passed away on June 4, 2010. That day was a life changer for me. We happened to be sick that weekend and uncharacteristically had the television on, allowing us to see some of the coverage…I am so thankful for that. I was deeply touched by what I learned about this amazing man that day. I haven’t written all that much about Coach Wooden here yet because every time I think about putting my feelings into words, I get a kind of terrified feeling. I think it is because I fear that I could never quite express how knowing about what he did with his life has affected mine and that of my family. Even now, I sit here with tears starting to form, a sick feeling in my stomach and a lump in my throat. What is this? I don’t really experience this with my writing, I am willing to share and be open about just about anything… Fear is a ridiculous illusion that tries to stop us from so many things, so I will just bulldoze right through it. Wish me luck please! As I sat there learning about Coach Wooden that day, I was stunned to see that someone like him had existed. There was so much more to the story than the man who had coached basketball so successfully. So much more. I SAW LOVE! I think it stood out because it was all men talking about this man and they were just so completely raw and open and loving as they recalled what Coach had meant to them and what knowing him had done in their lives. The coverage included a little about his great love for his wife who had passed away many years before. We saw that he had written her a letter every single day for twenty-five years since her passing. 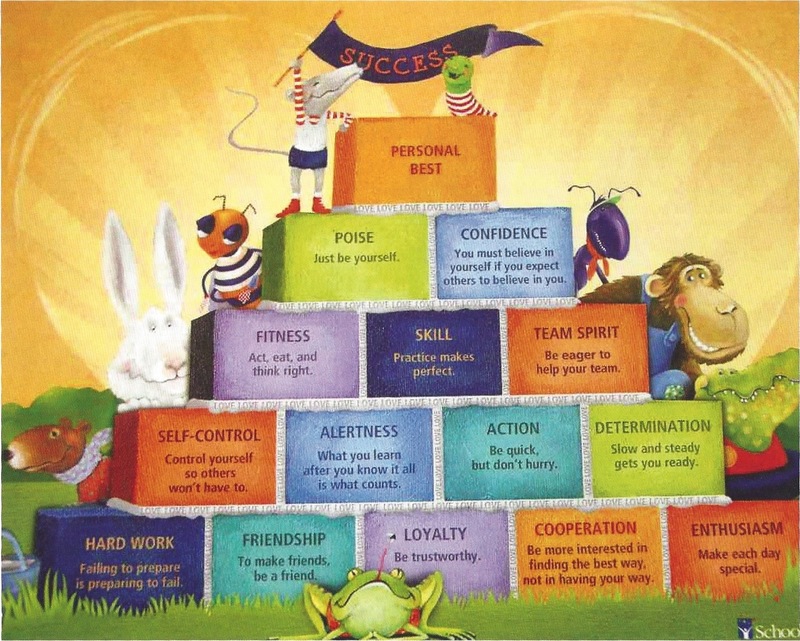 We saw some of his Pyramid of Success. We saw so much, but for me I wanted to know much more. I had to. I could attempt to explain all that the Pyramid and all of Coach’s work mean to me, but I know that it really can’t be put into words. It is much more than words. I will just say that I think it is very strange that they put his books in the sports section at the book stores. He taught about much much more than sports. He taught about life and he lived as an example. I am grateful for many teachers in my life. Just prior to reading all of Coach’s work, I had been reading various spiritual awakening books and memoirs. I was really trying to grasp consciousness and awakening and in some cases, reading and rereading the same books again and again. Somehow Coach’s work was exactly the piece of the puzzle that I needed at the exact moment…a gift from God. It felt like my grandfather explaining life to me in understandable terms. I probably couldn’t have understood Coach so deeply if I hadn’t already been changed by awe-inspiring lessons from many before I found him though, so for that I am grateful! I think of Coach’s work as the glue I needed as my foundation to understand all the other lessons coming my way and to make sense of all that I had already learned. I believe Coach Wooden was an enlightened being among us and the best part about him was that he was so humble he didn’t label himself at all. He was just a man, doing his personal best. We are all so blessed to have his example. 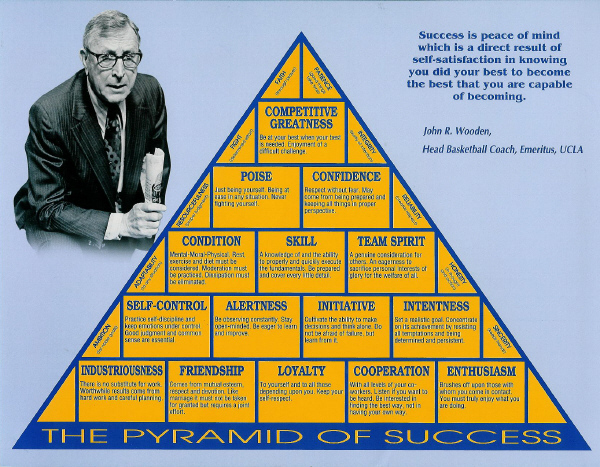 For me, the Pyramid and many more things I learned from Coach Wooden’s work are my foundation. That foundation is always there for me reminding me to work hard towards becoming the best version of myself, while being open to Life in every way possible. Life is always supporting and growing and blessing us with miracles and lessons, but we are also responsible for doing the work of co-creating with it. Coach’s work brings good old-fashioned character lessons and supports us while we also tap into the moment and the flow of God’s love that is ever-present. For me, it is the perfect combination. I am so grateful for the gift of Wooden Wisdom in my life! We love Coach Wooden’s books for children so very much. He did a great job in the later part of his life bringing his work to kids. In his last book, The Wisdom of Wooden, he shared a special picture and a great message about his children’s books. He said that the people at the company that worked to bring his kids’ books into classrooms asked him if he had ever thought about changing the Pyramid in any manner. Coach shared that when asked, he had replied, “No, except for one thing. I wish I had included the word ‘Love’ somewhere. Love is the basis for everything I do.” He was excited to share that they granted his wish by making him the picture below. You can see love in the cement holding the blocks together. It is so very special. I saw the love that day that I first learned of Coach and I will never forget it. The pictures in the children’s books don’t have the love in the cement…he shared this in his last book. I scanned it directly from the pages of The Wisdom of Wooden. I was not surprised at all to hear that was the only change he would make. I could see on that first day I learned of him that he was a man who lived full of love and I am so grateful that he showed me what a lifetime full of love looks like. From all the spiritual teachers I have learned that love is always the answer. I know that is why Coach mentioned this late in his life when asked…he knew deeply that love is the only answer and it is always the answer. He was and continues to be an amazing example of a life lived well and with lots of love. I can see as I try to wrap-up this post that it would take many more words to even begin to explain my feelings for Coach. I feel that I will have many opportunities to share my feelings in the future here on Live What You Know…for that I am grateful and to you, my cherished reader, I am grateful! Thank you! Please stay tuned for many more specific lessons I learned from our beloved, Coach Wooden. For now, lets just try to remember that love is always the answer. No matter what it is, stop and flex that heart muscle and you will feel it and summon the courage to use it. You can move mountains with love. You can forgive, cherish, laugh, cry, squeeze, smile, create, build, win, lose, adore and so much more with love and that muscle we call… the heart. Love is always the answer. Wishing you love!